As always, download link is at the bottom. 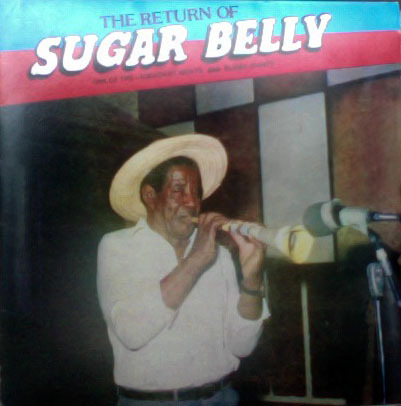 Here is what I know about Wilfred Walker: he played a bamboo saxophone that he crafted himself from scraps; he used his homemade instrument to play his own brand of Mento music under the name Sugar Belly. In the 1950s in Jamaica, before Reggae and Ska would have their day, people were shaking it up and dancing to Mento music. For those of you new to Mento, like me, music shares a lot with Calypso music from neighboring Trinidad and Tobago. This would be a great companion album with a previous post on this blog, The Fabulous McClevertys. Unlike the McCleverty album, this record is completely instrumental. It is a lot of fun and very easy listening. Like most Caribbean folk music, I find that it really suits itself for daytime playing. Throw this on in the car/bike as you cruise around town or even play it through a boombox on the beach. Sugar Belly is a rarity in record stores but also in that he is a self-taught musician playing his self-made instrument. That’s truly DIY.